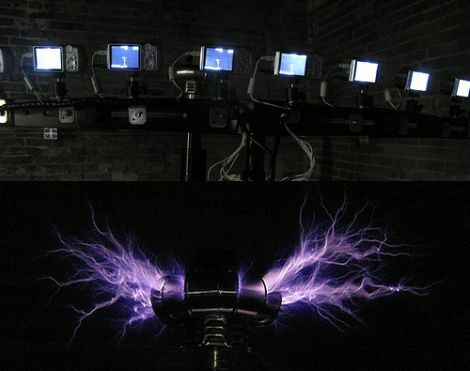 One thing we can all probably agree on is that Tesla coils are one part high-voltage electricity and two parts pure awesome. [Rob Flickenger] thinks so too, and he built a pretty nice one in his workshop some time ago. He took a bunch of pictures showing off the coil’s capabilities, but he thought that one photo taken from a single angle didn’t do much to relay just how fantastic it is to watch a Tesla coil in action. Taking a cue from the Matrix movies, he bought a stack of Canon point and shoot cameras and constructed a bullet time rig in his workshop. In order to get the pictures just right, he flashed each camera with a customized version of the CHDK firmware that allowed him to trigger all ten shutters with a single button press. A few scripts help facilitate collecting all of the images for processing, after which he identifies the good shots and stitches them together. You can see the awesome results in the video below. I don’t think I’ve ever seen arcs from multiple angles at a single point in time. nikola tesla would be proud. Not to nit pick but this isn’t bullet time. It is a multi-view time freeze. Bullet time would be where they fired the cameras very close, but independently to each other, so each frame was different. Sorry. Matrix fan and terminology purist. Still cool. Wonder how more wicked it would be if we could pool and get some more cameras and ring the whole tesla. From the description, I was expecting a complete circle of cameras to catch the action from all the way around like they used in the Matrix movies, but this is also quite good. Definitely the best and most interesting tesla coil photography I’ve seen. Hal, not to burst your bubble, but there are many definitions of what can be called “bullet time”. Warner Bros. trademarked the term but did not define an actual process, which happened to exist in one form or another far before the Matrix ever hit the screen. Not to say Wikipedia is the be all end all definition, but a terse interpretation such as the one you state fails to acknowledge other accepted examples of the technology as well as those which helped inspire the derivation used in the Matrix. Sorry. Reading fan and comment purist. I will however agree that to be bullet time, the object should be completely surrounded by cameras. Holy crap, someone send this guy like 100 more of these cameras. This is awesome! Did a similar camera trigger a few years back. Instead of modifying the cameras we used 3 IR blasters to trigger 24 JVC cameras at the same time. 95% of the time they all captured the same frame. Our biggest issue was camera alignment, we had cheap swivel mounts that wouldn’t stay locked in place. You can see some of the results here – including the poor camera alignment. @jpslater, you do realize that the CHDK ‘modification’ is/can be a software/firmware patch that will revert back to stock whenever the camera is powered off? Hence, there was no visible or irreversible modification done. I too would like to see even more cameras used, for a full or near full ring effect. Also some true bullet time shots where the cameras are fired in sequence (and probably placed very close together) for some moving arc shots would be amazing! @birdmun I didn’t mean to imply that the firmware approach to triggering the cameras was a bad thing, just that it was also possible to do it using cameras right out of the box as well. Im with the other people ,This IS amazing..But now I want, (NO NEED) to see the Telsa coil in slow motion as Im walking around it.! The first thing that comes to mind is synchronisation of cameras taking the photo. The time taken to send the signal to all cameras for the picture should be the same. These arcs occur for very short duration of time, so there may be some lag between. One thing I would love to see is influencing the air around the arcs. This would create different conductive paths. A simple test would be to put a lit cigarette near the arcs. Different chemicals would make different arcs, and lets not forget the excitation of different chemicals would create different colours. Jerry Whiting liked Power Stacker: Stackable Battery System. Martin has updated components for the project titled Sawppy the Rover remake. Martin has added a new log for Sawppy the Rover remake. Amos has added a new log for Tangible programming. justinbrowe liked The World's First Mobile Rollable Digital Display. booleanboy liked Power Stacker: Stackable Battery System. roelh has updated details to Kobold - retro TTL computer. Craig Hissett liked AutoFan - Automated Control of Air Flow. Tillo liked ESP32 Camera board. Yann Guidon / YGDES has added a new log for Mains protection box.